"Being able to not hear the noise, being able to listen and imbibe the meaning and then find a balance point in any matter. This is the ultimate tool, the most effective "weapon". This is the only way to find a "win-win" situation. 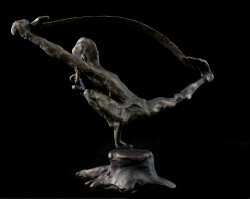 "This particular work is identified by its lively modeling that creates a natural play of light and shadow in movement. The whole composition has only one supporting point that generates a flexible tension, the perception of a stretched string that contrasts with the internal concentration of the figure. 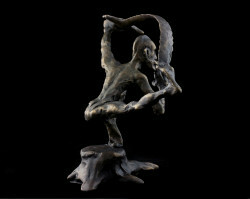 The important thing is the movement and posture which reveal their contents to the audience. 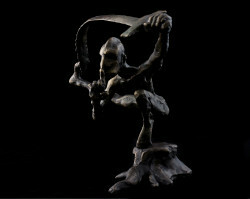 This grotesque sculpture is a part of the theme "Energy meanings", which performs such basic findings: to curb inner beasts, to find balance, to be brave at the door of the Unknown, to create without fear of losing and fly to own dreams. 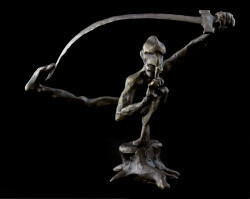 The Artist represents those energetic meanings, which people need now to model their better future.